Step 1. Create the project . In your account’s Dashboard, click on ‘Add a new project’. Give the project a name and, optionally, a description (which will be featured in the project’s join page). Step 2. Add languages to the project. 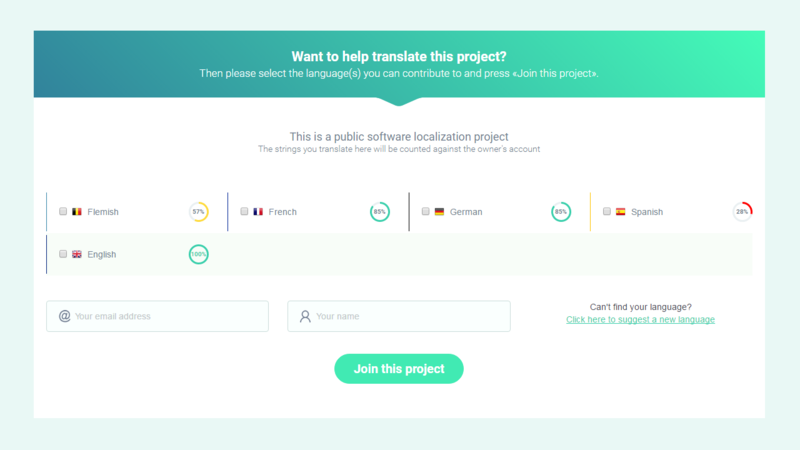 In the Project Page, use any of the buttons available to add the languages you want to have your software localized in. It’s recommended you also add the base/source language (the language your software strings are in right now). Step 3. Import strings from language file. In the Project Page, click on ‘Import terms’ in the side menu. Browse for your localization file and select to ‘Also import translations in…’ your base language. If your localization file contains labels/keys, set the language where you imported the translations as Default Reference Language. Step 4. Make the localization project public. Go to the Project Page and click on ‘Project Settings’ in the side menu. In Advanced Settings, set Public Project to Yes. Step 5. Share the crowdsourcing project’s join page. At the bottom of the Project Page, as well as in Project Settings, you’ll find a link to your public join page. Share it wherever you find appropriate: websites, forums, social media pages etc. People will be able to join the project’s translation team by accessing it. In Project Settings, you can add administrators and proofreaders to your crowdsourced translation project. Administrators can do pretty much everything the project owner can do. Pretty much, because he/she can’t delete projects, access the Bitbucket/GitHub integration pages or add/delete other admins. Proofreaders are contributors who can mark a translation as proofread or not in the languages they’re assigned to. To grant a contributor proofreading rights, enable Proofreading in Project Settings > Advanced Settings. Then use the Add Proofreader button under the Add Administrator button. You can revoke these roles in Projects Settings also, by clicking on the x next to the user’s name. You have some options to control the access to your crowdsourced localization project. New Contributors Require Moderation: makes everyone who joins the translation project through the public join page require your approval (the owner) or an admin’s, before being able to access the project. Contributors Can Add New Languages: lets people add new languages to the project in the public join page. Lock Completed Languages: hides any 100% localized language from the join page, so new volunteers can no longer join it. In your upper navigation bar, you can find a link to the Contributors’ page. 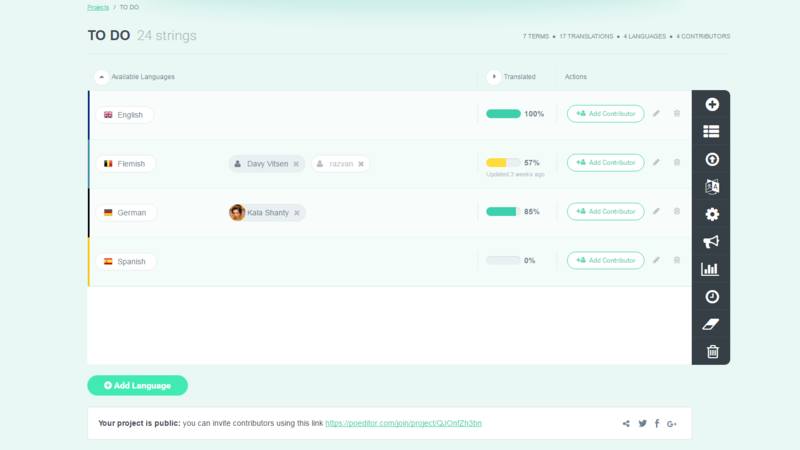 Here, you can control each contributor’s access to the project, after they have joined it. 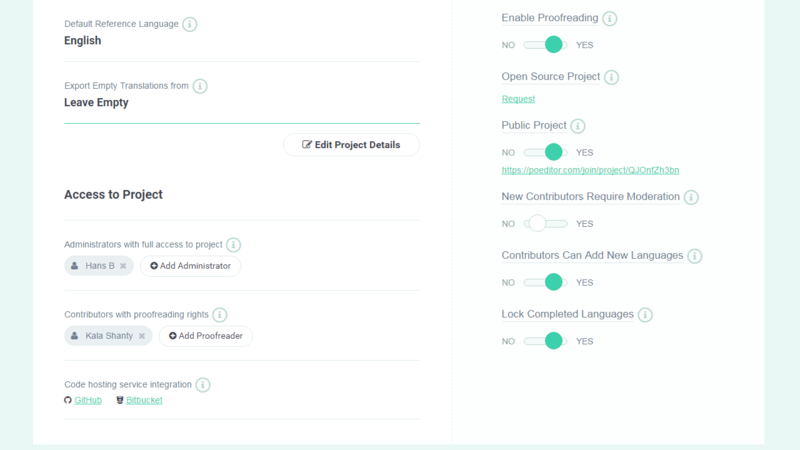 Next to each contributor, you’ll see a list of your projects to which he/she is contributing, as well as the languages to which he/she has access. Use the buttons described below to control their access. 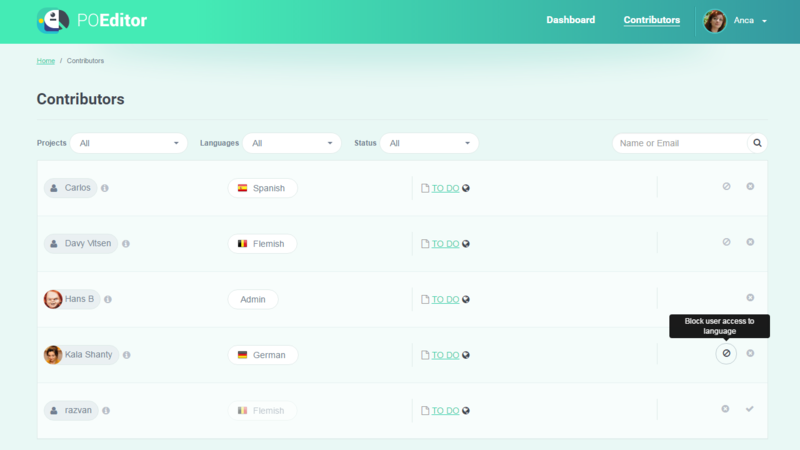 Now that you know how to set up a crowdsourcing project, assign roles to your volunteers and control the access they have to the project, maybe it’s time to go one step further with improving the localization process. This article on how to automate localization will offer more insights regarding the ways POEditor can help maximize productivity for your localization team.